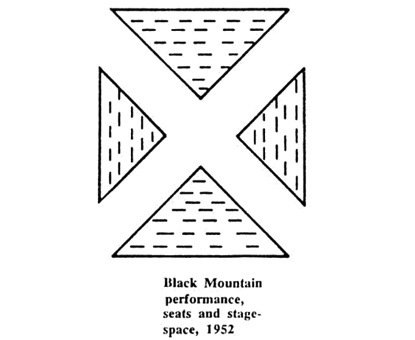 Floorplan of the untitled event at Black Mountain College (1952), drawn for the author in 1989 by M.C. Richards, showing the audience square and relative positions of the performers. Identifications have been added. Reproduced courtesy of M.C. Richards. Some documents offer an interesting view at the audience and the kind of seating arrangement in the dining hall. The seating plan for the “Untitled Event” shows its geometrical figure, a square “composed of four triangles with the apexes of the triangles merging towards the center, but not meeting” (3), as Cage described. This breaks up with the common principle of frontal seating arrangement, further wipes out the 4th wall. During the “Untitled Event” the audience could see itself and was finally itself part of the theatrical nature of the event. The performer moved around the audience, also in the aisles between the four triangles. The viewers experienced the performance thus as a 360° impression. But is that impression only caused by a square-seating arrangement? Why a broken square and not a broken circle? The effect would be the same, wouldn’t it? Did they need the straight lines? What was the idea behind it? It is this lack of knowledge, which forms the mystification. We don’t know the reasons, we just have these sources like a seating plan or some quotes, but the causes are missing. The seating plan for the untitled event at Black Mountain College (1952), reconstructed in 1965 (Kirby and Schechner 1965, 52). Reproduced courtesy of TDR/MIT Press. 2 Walter Benjamin: SW 2, 518–9. As pointed out there is very little documentation on “The Untitled Event”. There a “no two sources contain the same recollections, and many sources omit details.” (1) The huge influence of the “Untitled Event” that is reproduced by many authors and artists stands in direct contrast to the nonexistence of a solid documentation. Furthermore the nonexistence of documentation is responsible for the mystification of the “Untitled Event”. At first the different recollections are discussing the date, the durations and the time of the day of the performance. The informants are quite unsure in their memories. The duration differs from 45 minutes to almost 2 hours. 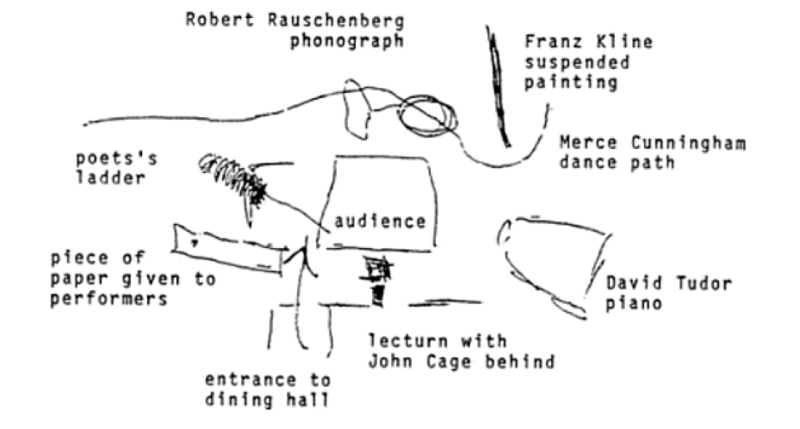 (2) Just the seating arrangement is explicitly named by John Cage himself. The performance description by Cages works in a relativizing way and ends with the significant sentence: “I don’t recall anything else except the ritual with the coffee cup”. (3) This comment underlines the fact that the evaluation and mystification are put upon this event as a strategy of recollection. As there is no score just a missing plan, the whole event is overloaded by expectations and rumors. As there is just the nonexistence of documentation everything that remains is the narration of a myth of the “Untitled Event” that remains unsearchable and promising. The importance of the performance “has become a part of a legend”. Cage and his friends have not appreciated the significance of the performance at that time. The significance was made by historiography. Das „Untitled Event“ gilt als Geburtsstunde der Performance Art. Wie alle Mythen stellt auch dieses Ereignis eine Form des kollektiven Erinnerns dar, von dem wenig handfestes Material erhalten ist. So stützt sich das Wissen über diese Performance, die wahrscheinlich am 12. August 1952 im Black Mountain College stattgefunden hat, nahezu ausschließlich auf die Erinnerung einiger, weniger Zeitzeugen. Der Kultwert als solcher scheint heute geradezu darauf hinzudrängen, das Kunstwerk im Verborgenen zu halten: gewisse Götterstatuen sind nur dem Priester in der cella zugänglich, gewisse Madonnenbilder bleiben fast das ganze Jahr über verhangen, gewisse Skulpturen an mittelalterlichen Domen sind für den Betrachter zu ebener Erde nicht sichtbar. Oh, I certainly didn’t get the impression that it was a historic event, perhaps because all the elements were familiar, and at Black Mountain we had been doing light, sound, and movement workshops, and putting all together seemed natural and not something really cultural-changing. Es scheint als läge die historische Bedeutung des „Untitled Event“ nicht wirklich in der Aufführung an sich, sondern in der Schöpfung eines Mythos, eines sich bis heute entwickelnden Narrativs über die Geburtsstunde der Performance Art. Es gibt keine wirklich aussagekräftigen Dokumente, es gibt keine präzisen Chronisten, es gibt keine erhaltene Materialität, abgesehen von vereinzelten Skizzen und Raumplänen. Gerade durch die Beschwörung des Ereignisses, durch das Betonen der Einzigartigkeit, der Flüchtigkeit und Unwiederholbarkeit jedoch, wird es möglicherweise zu eben diesem einen bedeutenden Ereignis, das so maßgeblich für die Performance Art werden sollte.